Local student Matthew Lawrence is being given the chance to train as an apprentice carpenter working on Wales & West Housing’s new £4 million affordable housing development in Pembrokeshire. 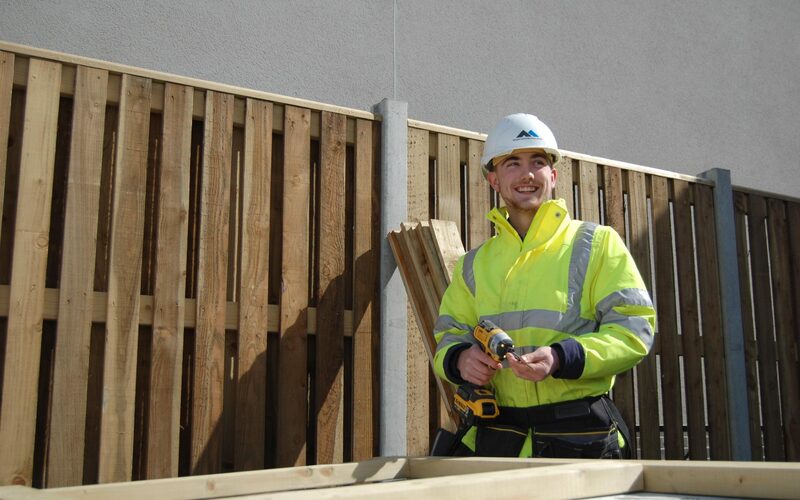 In January 2019 Matthew began his apprenticeship with contractors Morgan Construction Wales and has been gaining lots of experience working alongside professional tradespeople at the Parc y Cefn site. Matthew, 20, from Pembroke Dock, has been working on wall studwork, roof supports, door frames and floor joists in the new homes. One day a week he also attends Pembrokeshire College, where he is in the third year of a carpentry course. “I’ve been so lucky to get this apprenticeship with Morgan Construction and be given the chance to work on a Wales & West Housing development. Anne Hinchey, Group Chief Executive of Wales & West Housing, said: “This is a great example of the way we work with our partners to invest in the local community by using local businesses and workforces and creating job opportunities. Due for completion this spring, the scheme at Parc Y Cefn will provide 30 houses, bungalows and apartments for affordable rent for local families living and working in the Fishguard area.